Comics on sale at the Chuk and Geek shop in Moscow. 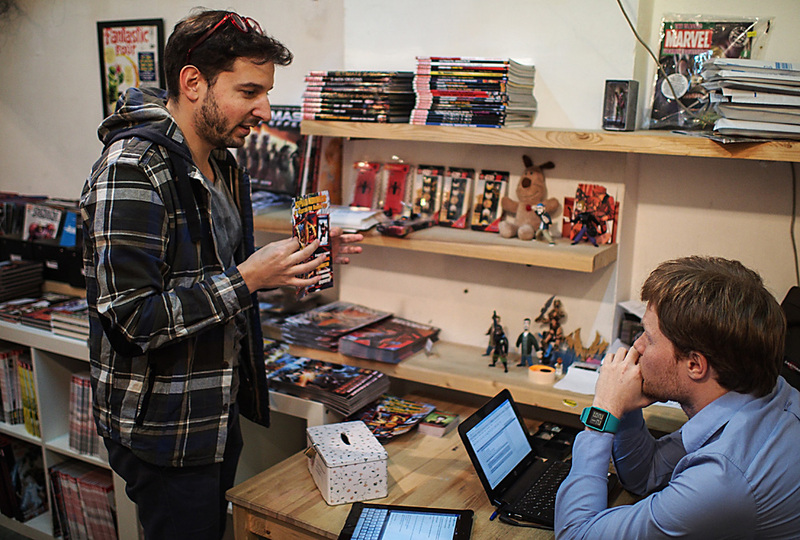 Muscovites Vasily Shevchenko and Ivan Chernyavsky borrowed $1,000 in 2011 and opened a comic book store. Now their two stores generate about $7,200 profit every month. Chuk and Geek (Ed. : this is a play on Chuk and Gek - a Soviet short story by Arkady Gaidar about two boys) is the oldest comic book store in Moscow and the most hospitable one says Artyom Gabrelyanov, the co-owner and chief editor of Bubble, the largest Russian publisher of original comics. Shevchenko and Chernyavsky had never thought about selling comic books, but they loved reading them. In 2010 they got tired of their jobs at a record company and during a joint trip to India the idea of opening a bookstore took shape. Preparations took two months. Shevchenko managed to get a considerable discount from his former employer on a batch of comics. He bought them with 30,000 rubles ($443) that he borrowed from friends. They found an appropriate spot for their store in a former gift shop in central Moscow. The owners of the building offered the budding entrepreneurs two stands and three weeks of free rent. In December 2010 sales amounted to 60,000 rubles, which allowed the entrepreneurs to begin to pay off their debts. By spring 2011 the shop had taken on an additional 20 square meter room and a 50-square meter warehouse was added. The interest for comic books throughout the city inspired Shevchenko and Chernyavsky to open a second store. They invested about 1.2 million rubles ($17,700) for repairs, furniture and lease payments. In the third month the new store broke even. Their second Chuk and Geek store features not just comics, but also science fiction, fantasy and children's books and related merchandise. Revenues from both stores now total about 3.5 million rubles ($51,700) per month. About 2.2 million rubles ($32,500) are spent every month on the procurement of goods. The two owners buy comics for the stores every week and at least once a month they place a large delivery order. Unlike in the book market, where the payment is made on the basis of an actual sale, comic books publishers demand a prepayment of 100 percent. "We usually try to keep several thousand dollars in reserve in case we need to buy something suddenly," Shevchenko says. By 2014 approximately 35 percent of the stock at Chuk and Geek were foreign language comic books. But due to the ruble’s fluctuations since then prices of foreign comic books have more than doubled. Nearly 100 percent of what is found on their shelves today is domestic comic books, including translated publications. At the end of 2015, the co-owners of Chuk and Geek became partners and investors in a new comic book publisher, Jellyfish Jam, founded by their former employee, Beata Kotashevskaya. The main advantage of the new publishing house is its partnership with Marvel Comics. "We managed to grab some good licenses," says Shevchenko. According to him, in 2015 Jellyfish Jam released several comic books, including "Ant-Man" and "Guardians of the Galaxy" with a total circulation of 50,000 copies; 30,000 have already been sold. Shevchenko estimated their investments in the project at 1.5 million rubles ($22,150). Chuk and Geek’s core audience is young people aged 14 to 25. "There are slightly more boys than girls,'' Shevchenko says. “Some of them are super strange characters, but cool. Once two big, bearded men in kangaroo costumes came to our store." Chuk and Geek has many regular visitors that Shevchenko knows by sight and name. According to him, good personal relationships with customers and within the team help business much more than advertising or incentive programs.